Over the last several years, labor union bosses have waged a war against truth, reason, and union-free workers, spending hundreds of millions of dollars of their members' money in order to get the deceptively-named Employee Free Choice Act passed into law. As the light shines brighter on this bill and the anti-democratic EFCA for what it is, a Big Union Bailout, the union bosses' propaganda machine has flung into full gear, spewing all sorts of half-truths and misleading information. In an effort to separate the unions' myths from the facts, this section has been prepared for you to learn the truth about the extent of the unions' propaganda. REALITY: The bill is a special interest grab-bag for union bosses, many of whom have found attracting members harder and harder in a changing world. Unions are not supporting EFCA for employees to "form" unions, union bosses want employees to become members of their unions. That is why unions have spent hundreds of millions of dollars of their members money to get this bill passed. EFCA is nothing more than an attack on you and employees like you who may wish to remain union-free. And, it is an attack on your employer. EFCA would effectively remove your right to a private, secret-ballot election (which is currently supervised by the federal government). It would also -- for the first time ever-- allow a government bureaucrat to impose a contract on you, your company and the union which could, ultimately, have very negative consequences for you and your employer. REALITY: In fact, EFCA does eliminate secret-ballot elections if a union organizer lures 50% + 1 of you or your co-workers into signing union authorization cards. The bill (view here) specifcally states that once unions have collected signatures from a majority of employees "the Board shall not direct an election but shall certify the individual or labor organization as the representative." Where unions are playing tricks with the public and the media is based on an unrealistic technicality: Employees could theoretically seek an election if they have collected less than 50% of employees' signatures, but union documents show they almost never seek elections with so little interest. UNION MYTH: Employers must intimidate employees -- it's the only way to explain why fewer people vote for unions than sign cards. REALITY: Internal documents show the AFL-CIO has long known that employees will often sign union authorization cards just to get the union organizer to stop harassing visits to the shop floor, the office, or at home. Or employees may want to allow their co-workers the ability to vote their preference on union representation with the ability to hear from both sides during an election. The real reason unions lose support during normal union election campaigns: when collecting union authorization cards the union salespeople often "forget" to mention the fine print of joining a union, like having to pay union dues and agreeing to follow union rules (at the risk of being put on trial, fined, or worse). UNION MYTH: "Card check" is the system to protect employees rights. REALITY: Politicians know secret ballot elections are best. Even the Congressman who authored EFCA urged secret ballots for workers in Mexico to protect them from coercion during elections to decide between two unions. Even unions know elections are better. They often demand their own employees go through the election process for joining a staff union, and organized labor officials have still kept the elections process for employees trying to get out of the union. View petition of AFL-CIO employees to decertify their union (through a secret ballot) here. REALITY: According to statistics compiled by the National Labor Relations Board, each year unions typically win between 50% and 60% of representation elections. Check out the NLRB's annual reports for yourself. UNION MYTH: Unions don't win enough first contracts which is why unions want the government to impose contracts through binding arbitration. REALITY: Everyone agrees that unions win about half the elections that occur and succeed in gaining a first contract for newly represented employees about half the time. For instance, union-friendly scholars found that after a majority of employees voted to join a union, the labor organization succeeded in getting a contract 56 percent of the time. They then claim that this is evidence of wrongdoing. In reality, the process makes a lot more sense. Employees go through the elections process. The majority of times a union becomes the "bargaining agent" of employees. Then, the employer and union try to negotiate a contract. Howver, if the union won its election by making grand promises to employees, the law does not require the employer to agree to whatever it was that employees were led to believe by the union. In essence, an employer is not required to agree to a contract that would threaten to put him out of business. If allowed by the union, employees, too, may have the right to vote for or against contract proposals. Each of those rights could be taken away by EFCA's binding arbitration provision. UNION MYTH: Employers force employees to attend meetings on the negative consequences of union organizing. REALITY: Since union organizers, whose jobs are tied to their success at getting new members for the union, are paid to only promote the cause of unionization, they ofted leave out much of the "fine print" in the union sales pitch. In fact, because union organizers are legally allowed to mislead workers into signing union authorization cards, many employers do call meetings to talk about the issue of unions to inform employees about little things like union dues, seniority rules that prevent young people from good shifts or even making more money based on their hard work, the requirement to follow strike actions, and more. 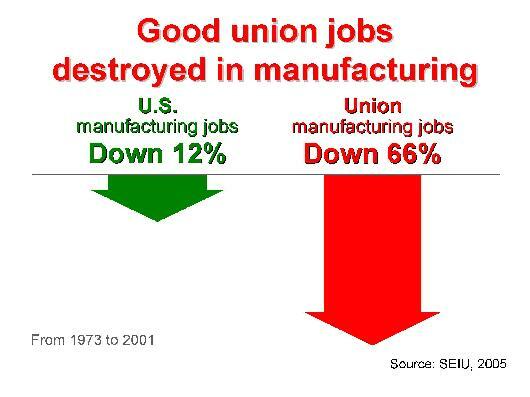 Despite this fact, though, unions still win a majority of the elections. However, at least the employees have had the chance to hear from their employer before casting their vote in a secret-ballot election. UNION MYTH: Employers threaten to shut down and leave if their plant is unionized. REALITY: Current labor law prevents employers from making threats (or even promises) to employees about what life would be like if they unionize. This can have the ironic effect of preventing them from explaining that unions can place so much financial stress on companies that they may be forced to shut their doors. UNION MYTH: Employers fire a lot of workers in union organizing campaigns. REALITY: In 2007 and 2008, according to statistics published by the National Labor Relations Board (the federal agency that oversees the conduct of both employers and unions during union organizing campaigns), less than 4% of the more than 4,200 election petitions involved any charges of wrongful termination that had any merit. Even in those rare cases where an employer wrongfuly discharged someone, under current labor law, that individual is eligible for back pay and reinstatement. 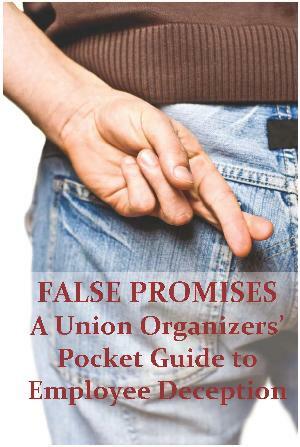 Read the report compiled by the Center for Union Facts here on how unions are manipulating the truth. The fact is, the basis of the unions' bogus claim stems from various "studies" that repeat allegations of employees fired during union organizing drives at an "astounding" rate. The most widely referenced "study" was conducted by a former union organizer sending surveys to fellow union organizers. A follow-up was done by a union-funded front group by an author that received significant sums of money from unions at the same time. REALITY: Each year, like clockwork, the AFL-CIO continually releases the same, tired claims (based on a poll conducted by a union-funded polling company), that a majority (or tens of millions) of working Americans want to join a union. The union bosses hope that this is "evidence" of hidden "demand" for union services. The unmet demand, then, would indicate some nefarious force that is preventing employees from getting the representation they deserve. But the union won't release its polling questions so no one knows if it's credible. On the other hand, Gallup polling suggests people know very little about unions and two out of three people don't want unions to have more influence. Other recent data suggests a majority of Americans do not want their workplace to be unionized. UNION MYTH: EFCA and unionization will lead to greater job security for millions of Americans.